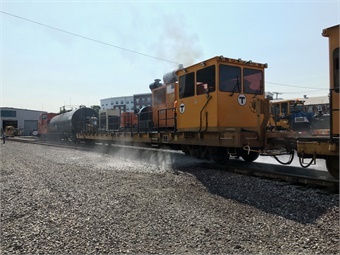 Keolis Commuter Services (KCS), the MBTA’s partner that operates the commuter rail, is working to ensure that when leaves begin to fall, the railroad is prepared to reduce the impact of what is known as slippery rail. Slippery rail occurs when leaves and debris fall onto the track. As trains pass, these transform into a thin and slick film that accumulates on the tracks. When fall arrives New England residents typically think of the scenic foliage. However, commuter rail team members think about the important preventive maintenance required to help ensure service for the network’s 127,000 daily passengers. In these fall conditions, trains are required to begin slowing for stops sooner and take more time to re-gain speed when departing a station. As a result, a train needs more time to travel its route, which can create delays. Occasionally more wheel maintenance is also required, and this can impact coach or locomotive availability. Year-to-date on-time performance on the commuter rail is 89.3%, only slightly behind the company’s target of 90%.